Gov. Mary Fallin and key lawmakers are pushing new legislation this year that would require Oklahoma doctors to check an online database before writing prescriptions for addictive painkillers and other frequently abused drugs. The compromise bill currently being negotiated with physician groups would require doctors to check the database the first time they write a new prescription for three classes of addictive drugs and at least once every 180 days after that. In a concession to physicians, the legislation would exempt drugs prescribed at nursing homes. It also contains a five-year “sunset” provision that would allow the law to expire unless the Legislature voted to reauthorize it. Last year, the governor and her legislative allies fell a few votes short of advancing a bill that would have required doctors to check the database every time they wrote or refilled a script for a much longer list of drugs. Groups representing medical doctors and osteopaths actively opposed it. “I’m hoping this will be an example of how Oklahoma is different than Washington, D.C., and that we can all live with a compromise that no one likes just because it’s not the perfect bill,” said Rep. Doug Cox, the measure’s House author and key negotiator. The prescription check legislation is intended to address an overdose problem that some health experts say has reached epidemic proportions in Oklahoma. Last year, more than 800 Oklahomans died from overdoses, many of them after taking medications prescribed by their own doctors. 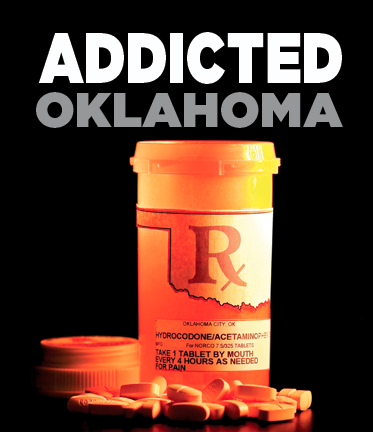 Oklahoma has one of the highest narcotic prescribing rates in the nation. “We want to be part of the solution,” said Wes Glinsmann, director of state legislative and political affairs for the 4,500-member Oklahoma State Medical Association, which represents M.D.s. “We’ve been trying to work for legislation that really addresses the problem, without overburdening the physicians and patients on drugs that really aren’t the problem,” Glinsmann said. Oklahoma, like most states, has an online Prescription Monitoring Program. Pharmacies are required to log every prescription for controlled dangerous substances within five minutes of filing it. But doctors are not required to check the PMP registry to make sure their patients aren’t obtaining prescriptions from other physicians, and many doctors don’t bother to check. Last year, Cox, Griffin and the governor’s office failed to win approval of legislation that would have required doctors to check the PMP every time they wrote or refilled a prescription for Schedule II or Schedule III controlled substances. That included all of the addictive opiate painkillers such as oxycodone and hydrocodone as well as many non-narcotics such as testosterone and other hormone supplements. The Oklahoma State Medical Association and the Oklahoma Osteopathic Association lobbied against the measure. They said the mandatory checks would place an unnecessary burden on overworked physicians and their staff members. This year’s legislation is a scaled-down version of last year’s. It would require PMP checks for only three types of drugs: opiate painkillers such as OxyContin and hydrocodone, benzodiazepine anti-anxiety medications such as Xanax and Valium, and carisoprodol, a frequently abused muscle relaxer marketed as Soma. Cox said the 180-day recheck provision is a key compromise needed to secure the support of doctors and osteopaths who don’t want to check the database every time they authorize a refill. Most opiate painkillers and other commonly abused substances must be reauthorized every 30 days. Oklahoma Mental Health Commissioner Terri White, who is helping negotiate the PMP bill, said its passage was critical. The bill contains exemptions for drugs prescribed at nursing homes and for end-of-life or hospice care. The nursing home provision wasn’t in last year’s bill. Two other additions to the bill are notable. One would include veterinarians, who sometimes prescribe narcotic drugs for treatment of animals. They would be required to check the PMP to make sure the owners aren’t obtaining unusually large quantities of abused drugs. Another new provision would require the Oklahoma Bureau of Narcotics and Dangerous Drugs to forward a monthly list of the top 20 prescribers of controlled dangerous substances to the licensing boards governing medical doctors, osteopaths, dentists, optometrists, nurses and podiatrists. Last year, Oklahoma Watch and The Oklahoman published an investigative report showing, among other things, that enforcement efforts were hindered because state agencies sometimes failed to share information about overdose deaths and overprescribing. The bill also contains provisions authorizing the Oklahoma Health Care Authority to reimburse doctors who use a more expensive urine-testing process to spot abusers among the Medicaid patients they treat. In her 2015 “State of the State” address Monday, Fallin urged the Legislature to pass the PMP measure this year, noting that Oklahoma ranks at the top of the nation in prescription drug abuse. “There are things we can do here at the Capitol, starting by passing a prescription drug monitoring bill that cracks down on the practice of “doctor shopping” and ensures we aren’t prescribing narcotics to addicts,” Fallin said. The Oklahoma Bureau of Narcotics and Dangerous Drugs filed this order April 2 revoking the narcotic prescribing license of Dr. Ronald Myers of Roland.